The base at Marina Wolfsbruch, situated at a stunning new holiday centre, offers a swimming pool, water sports, Jacuzzi, sauna and many other amenities including restaurants, bars and shops. Potsdam is a UNESCO World Cultural heritage site with varied buildings and history. For this trip a licence is required. This is a special cruise in the heart of the countryside passing through Potsdam. At Furstenberg, admire the imposing Baroque palace followed by the nature reserve on the upper reaches of the Havel as far as Mildenberg. A detour by Himmelpfort and the moorlands of Schorfheide as far as Lychen; head for Orianenburg with its castle and on to cosmopolitan Berlin. Visit the Reichstag and Brandenburg Gate, stroll through the Tiergarten, and see the Eastside Gallery with the longest surviving section of the Berlin Wall. Continue on the Havel to the rivers around Potsdam, the Glienicke bridge, Babelsberg, Paons Island. 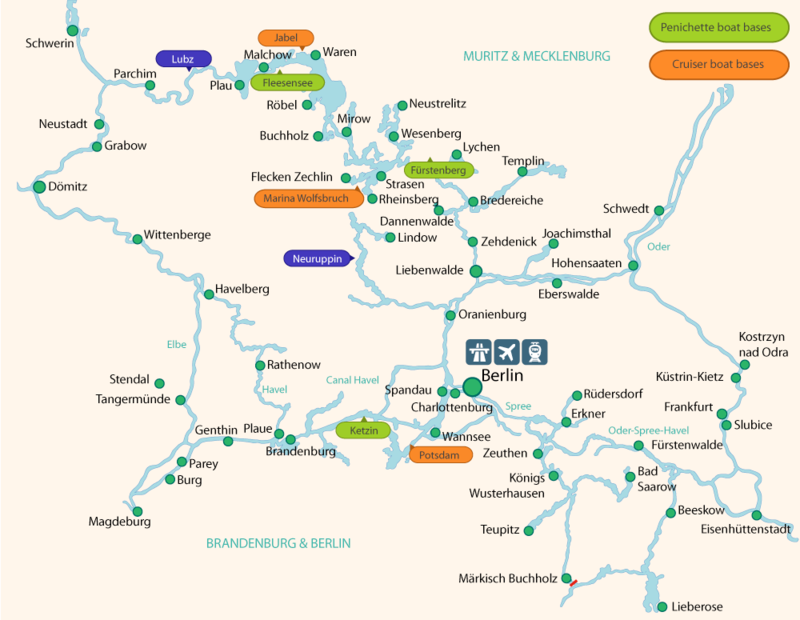 The chance to get to know your boat on the waterways of Rheinsberg and Zechlin. After the lock at Wolfsbruch, you go towards Canow as far as Mirow to discover its original Baroque castle, then take the waterways of Muritz-Havel, go through Canow and Wesenberg to connect you to Furstenberg and the green landscapes around Lychen. A mixture of rivers and canals offer a kaleidoscope of delights for the boating holiday maker. Visit the historic castle of Rheinsberg; discover a whole selection of picturesque small towns. Mirow offers a chance to swim; the magnificent Muritz lake, the largest in Germany, is unforgettable and everywhere the countryside invites exploration. There are frequent guided tours of the medieval town of Plau. * A boating licence is required if you would like to navigate the waters around Berlin and Potsdam. A pilot can be hired who will guide you from Potsdam to Liebenwalde or vice versa, from there you can navigate on your own to Marina Wolfsbruch. You can also use a pilot to navigate the waterways around the Spreewald.